The North Anatolian Fault (NAF) is major fault system with a history of large earthquakes that extends across Turkey into the Aegean Sea. 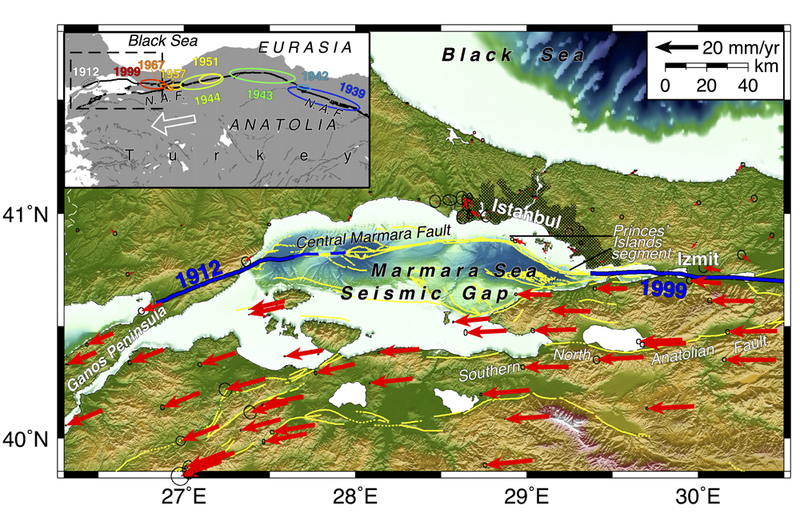 The fault disappears, literally beneath the Sea of Marmara, and seismically because few earthquakes are recorded in the so-called Marmara seismic gap. Twenty years of GPS observations indicate that the Princes’ Islands fault segment under the Sea of Marmara has accumulated significant strain and is the most likely segment to generate a magnitude ~7 earthquake in the future with consequences for Istanbul and other populated areas. The NAF is a major right-lateral, strike-slip fault system that extends for more than 1200 kilometers from eastern Turkey to the Aegean Sea. It marks a major plate boundary between the Eurasian and Anatolian plates and accommodates about 25 millimeters per year of motion. In the 20th century, there were eight large magnitude (>7) earthquakes propagating primarily from east to west along the NAF. Near the western edge of the NAF, just beyond where two large earthquakes (İzmit and Düzce) ruptured the fault in 1999, the fault separates into a northern segment, and a southern segment. The northern segment follows İzmit Bay and then passes beneath the Sea of Marmara. 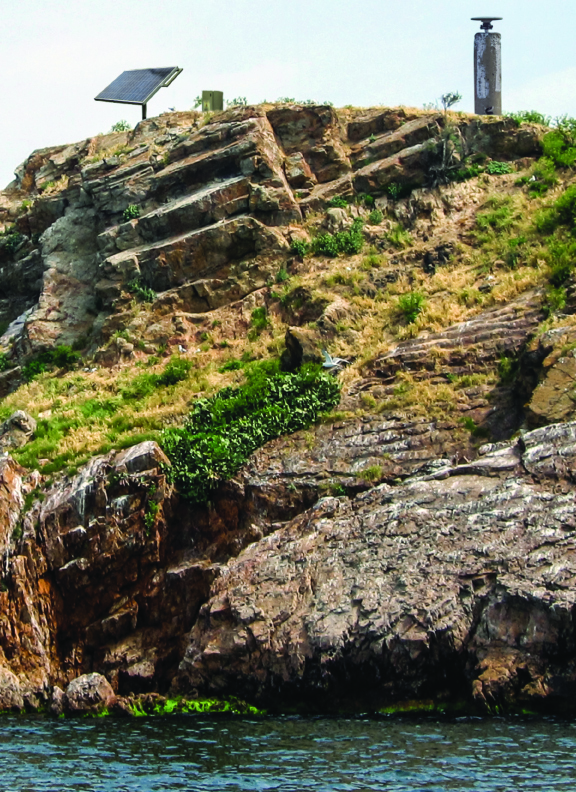 The Sea of Marmara part of the fault segment is further divided into the eastern Princes’ Islands Fault (PIF) connected to the western Central Marmara Fault (CMF). Both extend below the Sea of Marmara, making observations of fault processes difficult. Twenty years of data from about 100 GPS sites in Turkey have been analyzed and modeled to understand the amount of strain accumulation along the fault segments in the Sea of Marmara. The results show that the PIF has a high rate of strain accumulation, about 10-15 millimeters per year and thus is most likely to generate an earthquake with a magnitude ~ 7 than other segments in the “seismic gap”. This analysis provides a better estimate of the character of future earthquakes near İstanbul, Turkey’s largest city, to aid with planning preparation and response. References: Ergintav, S., R. E. Reilinger, R. Çakmak, M. Floyd, Z. Çakır, U. Doğan, R. W. King, S. McClusky, and H. Özener (2014), Istanbul’s earthquake hot spots: Geodetic constraints on strain accumulation along faults in the Marmara seismic gap, Geophys. Res. Lett., 41, doi:10.1002/2014GL060985.